Remember Friday, June 30th is International Asteroid Day—or have you forgotten that we share our neighborhood of the solar system with a million chunks of rock and metal? Many of these fragments even cross Earth's orbit threatening a collision. Asteroids are left over bits from the solar system’s formation—stuff that didn’t get rolled up into the formation of the planets. 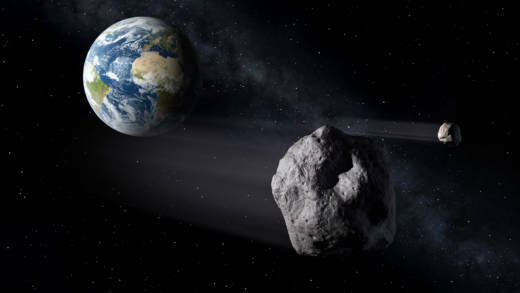 Set on the June 30th anniversary of the "Tunguska" explosion and impact over Siberia in 1908, International Asteroid Day is intended to raise awareness about the possibility of a "Near Earth Object" (NEO) hitting Earth. The goal is to solicit support for NEO research including detecting and tracking the objects, predicting future impacts, and developing technologies and techniques aimed at averting them. International Asteroid Day was co-founded by Grigorij Richters, the B612 Foundation and Brian May of the rock band Queen. All three have an interest in asteroids: Richters' film "51 Degrees North" depicts a fictional asteroid impact in London and the B612 Foundation is dedicated to defending the Earth from devastating asteroid impacts. Perhaps most interesting is Brian May of Queen who is not only a guitarist but also an astrophysicist, interested in rock of both the musical and astronomical variety. Rocks falling from the sky and sparking explosive mayhem are not part of most people's everyday experience--beyond the occasional sighting of a meteor flashing across the night sky. In fact, every day about 100 tons of material, mostly dust-sized particles and small bits of rock and metal, enter our atmosphere and drift downward to the surface. And every year, 25 to 30 asteroids—typically less than 100 feet across—pass by Earth at distances closer than our moon. Larger objects have caused major disturbances, but are less frequent. The 1908 Tunguska event in Siberia was caused by an asteroid or comet that was between 200 to 620 feet across, which exploded in the atmosphere. The resulting blast flattened over 700 square miles of forest—an area about the size of Alameda County. The 2013 Chelyabinsk event (another aerial explosion over Russia) inflicted considerable damage to buildings over a wide area with its shock wave, but was caused by a rock only 60 feet across. Asteroids larger than 300 feet across will impact Earth's surface and probably leave a crater, as well as cause devastation in the region they strike. This scale of impact happens on average every 10,000 years. Asteroids larger than half a mile across will create global disturbances and can cause mass extinctions. This magnitude of impact happens on average every several hundred thousand years. Our solar system is home to uncounted millions of asteroids, chunks of rock and metal ranging from a few hundred miles across to a few feet in size, and everything between. This interplanetary "rubble," most of which orbits the sun in the Main Asteroid Belt between Mars and Jupiter, is material left over from the solar system's formation five billion years ago—stuff that didn't get rolled up into the formation of the planets. The largest asteroids—those that are tens or hundreds of miles in size—don't concern us much regarding collision threats. These mostly reside within the Asteroid Belt and don't come near the Earth. They're large enough for us to detect at great distances, and astronomers know their orbital paths with high accuracy. The smallest bits of rock—those less than a hundred feet or so in size—are also not a major concern. Though they are small enough to elude detection until they get very close—literally coming at us out of the dark—they're not big enough to cause major damage even if they hit, and may break up or explode in the atmosphere before impact, as the Chelyabinsk meteorite did. But protecting ourselves from possible major future impacts is all about being aware of what's out there, and predicting a possible strike far enough in advance to give us time to do something about it. With enough advance warning—a few years would be great—a relatively minor and well-placed "nudge" to an inbound NEO can make the difference between it hitting us and cruising safely by. Developing the capability to give a NEO that nudge is one of the B612 Foundation's primary objectives. 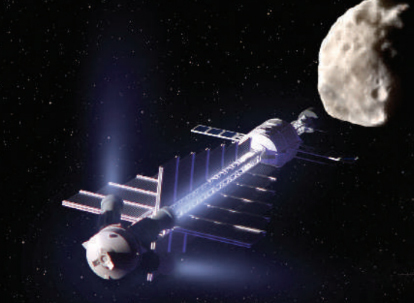 Concepts like massive robotic "tugboat" spacecraft that would gradually alter an asteroid's trajectory are being explored, as well as using a form of solar sail or reflector to harness sunlight pressure to deliver the needed nudge. 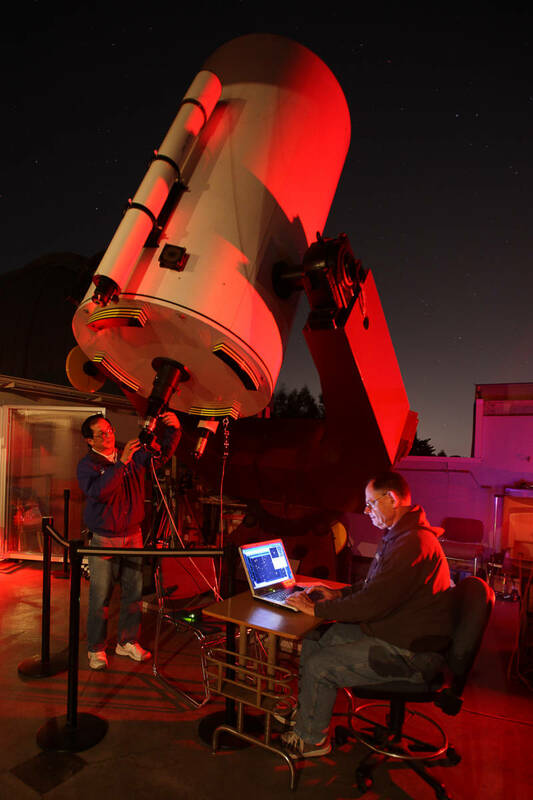 On the early detection side of the equation, astronomers around the world, both professional and amateur, work to detect and track NEOs, and supply their observations to the International Astronomical Union's Minor Planet Center, which tracks all known NEOs and uses the observational data to calculate future impact probabilities. Astronomers at Chabot Space & Science Center participate in this world-wide effort, using our 36-inch reflecting telescope, "Nellie." If you want to learn about this work first-hand, come up to Chabot on June 30th for a day of asteroid fun and fascination…and awareness.